All the clues said that I would love this book. First, all my friends on Goodreads hate it (like, they cringed having to give it at least one star). Second, it is incredibly sad and funny at the same time (like, laughing while blood and bile flow out of their dying mother’s body; umm, yeah…anyhow). And finally, the plethora of awards it received, including several Book of the Year nods, as well as being a finalist for the Pulitzer Prize (HIROHITO AND THE MAKING OF MODERN JAPAN ended up winning that year). Dave Eggers did his best to make me want to hate his book, but I kept on loving it. 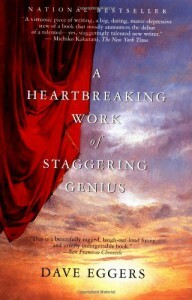 Eggers, while giving the appearance of ease, creatively and masterfully tinkers with your emotions. From the very get-go, right in the copyright information, Eggers is working his playful genius. And yes, the title itself is not all that much of a hyperbole. Eggers might just be a genius in this creation of his heartbreaking work. The story itself speaks of Dave’s care of his younger brother Toph (Christopher), as both a father figure, brother, and friend. The reason being is the tragic loss of their parents and the pre-occupation of their other two siblings. Dave, in his early twenties, is seeks ways to grab a responsible income, care for his brother, and live a bachelor lifestyle. And through embellishment, sarcasm, and desperate wit, Dave transcribes it all for us, including the creation of his magazine MIGHT. Much of what turns away audiences is what lured me in. Dave uses the repetition of the morbid for a crescendo, leading to a sardonic punch line. At the delivery, you feel as if you’ve been included in the inside joke. You laugh, because you were there. You get it. Dave probably drove away the rest of his unamused audience via his experiments in literary devices, such as the inclusion of maps, sheet music, and movie script-like segments. At the beginning of the book, Dave gives instructions on how to really enjoy the book, including skipping pages 209 through 301. I think he meant pages 161 through 208. Over forty pages of an interview for the MTV show REAL WORLD was a buzzkill. The experiment was funny and insightful—at first—but the pleasure quickly diminished. Dave recovers nicely after “playing around” and gets back to the meat of the matter. His care for his brother is the constant theme and it shines through the constant neurotic thoughts of Dave in all of his adventures: women, comas, drunken revelry and business shortcomings all included. This is a great book that resonates well with me, as it probably did with many other readers and reviewers. If you can stomach the mad literary scientist feeling of Dave Egger’s writing, you’ll probably love this, too.